Thou Shalt not back "To win both halves" and lay "half-time/full-time"
One of the most common mistakes people make is confusing the "team to win both halves" market with the "half time/full time" market. These are not the same and so you cannot back one and lay the other as your funds will be at risk. You should never place a lay bet first, ever. The bookmakers are changing their odds all the time, and occasionally they'll restrict accounts without telling people. If you place a lay bet, and then go to place a back bet you might sometimes find you can't get the full amount you want on which will leave you in big trouble. It's always a good idea to check the promo terms and make sure you fully understand what to do when taking up an offer. By this, we mean check how much you need to be betting, what minimum odds you need to be betting on, and what markets you need to bet on. If you don't fullfil the terms properly then you might not get your free bet. At Team Profit we provide support for risk-free matched betting, and not gambling. You should never gamble! Stick to the risk free side of things and you'll see your matched betting bank grow without risk of losing any of it. And if you do feel like you have a problem then seek help. Multi accounting is a grey area legally speaking and so you shouldn't really do it. Because of this, to cover ourselves and to cover you we ask that you simply don't speak about it either. Every weekday Tom will post his lunchtime profits at 12pm noon sharp. This will show the best ways to make profit on your lunchbreak and can vary from a quick free bet promotion to an easy casino or bingo offer. Price boosts are an amazing type of promotion that is overlooked by a lot of people. Some boosts can be worth £10+ for 1 minute of work, so make sure you check out the guide on how to use Oddsmonkey's price boost thread and set up notifications so you can start making a decent profit. Team Profit was set up to teach you about matched betting, offering help and guidance along the way. If you have any questions then make sure you ask us via live chat, email or our facebook group - we have tonnes of guides for you. 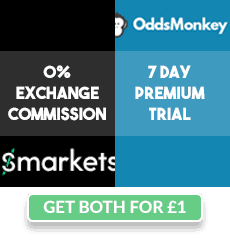 Oddsmonkey have loads of features that make them worthwhile to use when Matched Betting. Their flagship product is the Oddsmatcher, a tool which grabs all of the odds for you live saving you a lot of time. They also have lots of other tools and matchers, a forum, and a daily offer calendar. Matched betting is supposed to be fun, so relax, enjoy yourself, and keep smashing the bookies!